I don’t know what happened, but all of a sudden there’s a new crop of 3-D fractals sprouting up and they’re seriously amazing. 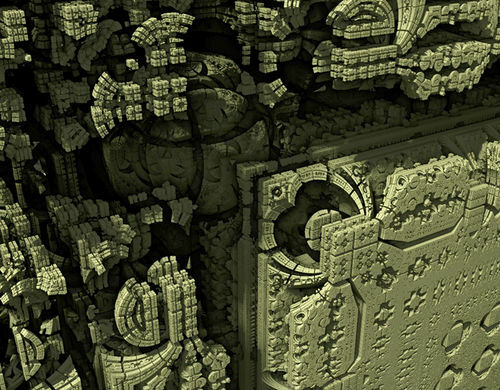 I’ve seen 3-D fractals before but these Mandelbulb and Mandel-box things have taken 3-D to a whole new level of sophistication. The best phrase I can think of to describe them is Majestic Panorama. It’s like a glimpse of a new world and not merely a new rendering technique or formula. There’s a depth and style to these types of 3-D images that I’ve only seen in photographs and oil paintings and never before in digital art. 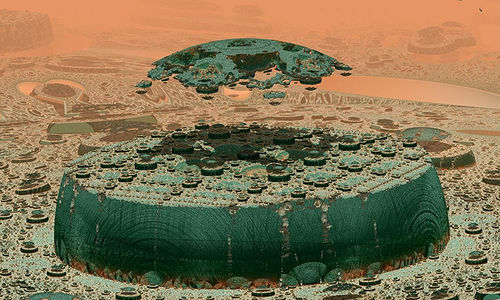 I found them all in the Gallery section of Fractalforums.com, my latest re-discovery in fractal art. Is it only eye-candy? or 3-D video game backgrounds? 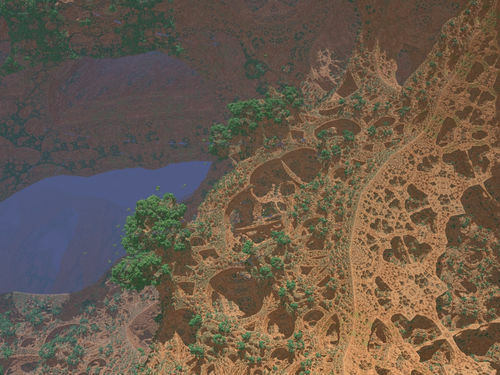 Or is it the start of a new genre of fractal landscape and panorama that began with programs like Terragen, Bryce and Xenodream but has only now reached a level of sophistication and creativity that sets it apart from everything else ? 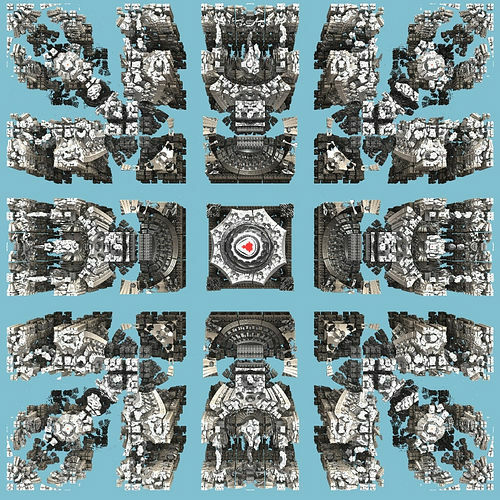 It’s this kind of powerful algorithmic creativity that first got me interested in fractal art and then led me to look elsewhere as most fractal artists headed off down the dead end road of endless layering. Yes, what a breath of fresh air these bold new 3-D things are –however you may like to label them. Like all of these images, you really have to view them fullsize which you can do by clicking on them. This one really shows the freaky, sci-fi and particularly three-dimensional awe and wonder aspect to these types of images. The landscape itself is intriguing but the hovering island (and copper/emerald color palette) makes this image simply monumental. Also, the hazy, “aerial perspective” accomplished in the rendering makes this image look extremely polished and as carefully created as if it had been painted by hand in oil paints. Click it to check out the larger version at Fractalforums.com. What makes the detail in images like this so spectacular I think is the depth and incredibly realistic lighting. Although ray-traced images can be intensely realistic and almost “perfect” looking, they don’t have that “aerial-perspective”, that vast expanding background and distance that this images demonstrates so well. This reminds me of something painted by the old masters like Raphael in his The School in Athens fresco. Of course no 3-D fractal will have the expressive human figures and all those sorts of things that human painters depict, but they can like this one match the magnificent perspective and three dimensional design that Raphael’s setting and background has. Actually, I think MarkJayBee’s image here is better in that respect. Sorry, Mr. Raphael, but you just didn’t have the Mandelbulber program to help you back then. Doesn’t this have a certain Maxfield Parrish look to it? I don’t know what all the programming and rendering tools were that went into this one, but the results are unlike anything I’ve ever seen before made digitally. I don’t just mean the lighting and 3-D look, I mean the creativity in the image itself also. This has the variety and unpredicability of a real, natural landscape. It doesn’t have the repetitive look that most fractal formulas have. There’s recursion here, but it’s not carbon-copy or of a purely repetitive nature like say, sierpinski objects have. You could wander around in this small sample of landscape for ages and not have explored every detail. Here’s a good closeup of the exquisite and wondrous detail that these 3-D “things” have. Such things as this, although they look realistic enough, could never be made (gravity’s not a problem in the Mandel-Worlds like it is here) but if they could they would rival the sculpture and design of any human made temple or architectural wonder, at least from a design perspective. Knighty chose a good title as the image speaks for itself and who could ever give this a fitting name? I saw a lot of very intriguing architecture and 3-d works in the Star Wars second series of movies, but this kind of imagery exceeds that in quality and creativity. And these “things” can be animated, too. Here’s an even bigger version than the one you’ll find at the Fractalforums.com gallery. 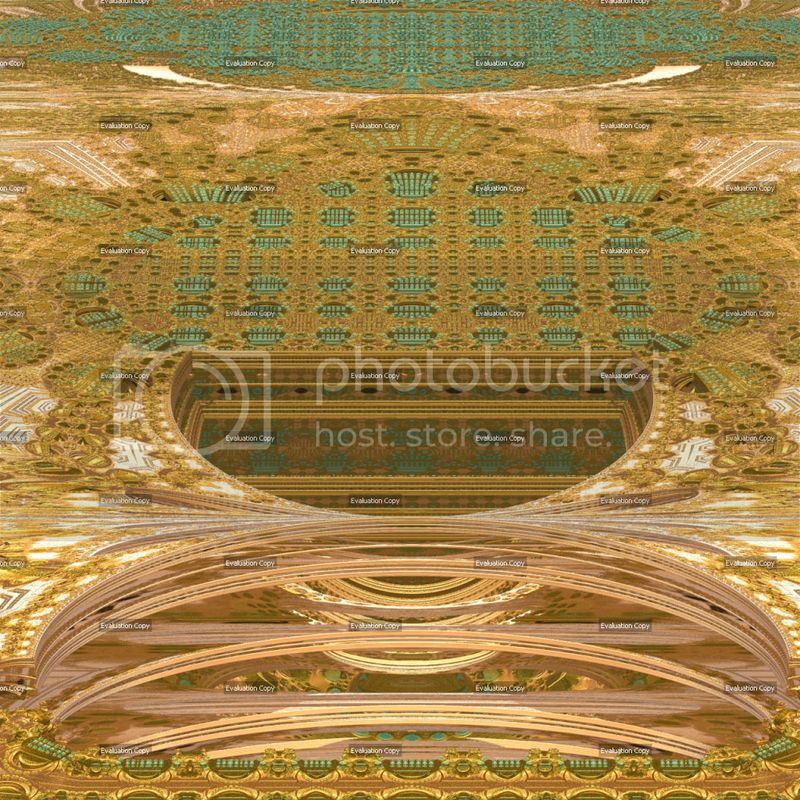 You can clearly see by the “Evaluation Copy” watermarks that this image is fresh from the laboratory. I’ve included it because, like all the others, it’s such a majestic panorama. I was really stunned when I first stumbled on this one. It’s got the level of detail that only electron microscope or satellite photos usally have. The title is quite appropriate too as it does resemble a vast area of farmland in the desert like a kibbutz in Israel. There’s so much variety and well rendered details in this one that I just had to include it even though it’s got all those watermarks on it. You can’t get a better example of perspective than this image. This is like those Grand Canyon photographs that one sees in every travel magazine: you just want to dive into the picture and fly away. Artists used to spend a lot of time and get paid good money for making spectacular scenes like this. We’re really living in a golden age of art, or if you prefer, visual imagery. We’re seeing things every day that most explorers and world travelers could never imagine or hope to visit. 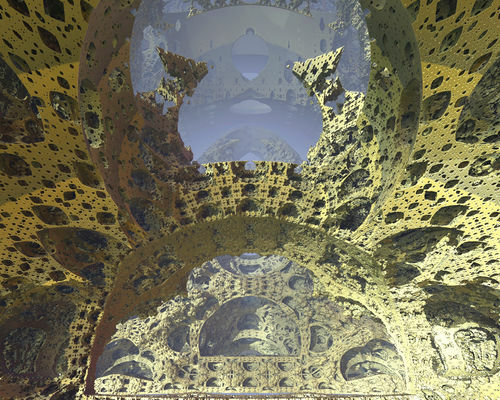 Reminds me a bit of Dave Makin’s video tour of the inside of his golden sierpinski temple which I included in a previous posting on animation. Again, look at the incredibly lifelike perspective shown in the mouth of the “hole”. These images are so vividly rendered and yet also so full of rich algorithmic details. The green, “tarnished bronze” coloring is a nice touch too and adds a subtle outline and resulting perspective to the image. I keep expecting to see someone walk up to the balcony railing and begin to issue a royal proclamation. This would make a nice model for rebuilding the Jedi Temple. This one really needs to be view full-sized to fully appreciate it. What I find most impressive about this one is that although everything looks like it’s been roughly chopped out of stone, there is a precision and carefully laid out design that it all fits into. Very intricate and yet having a primitive style to it at the same time. 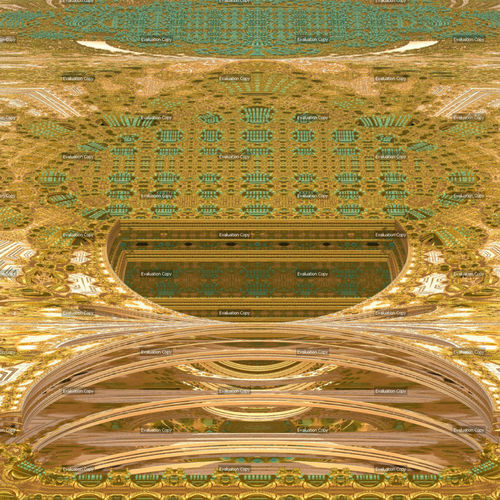 Also, although the image has a reflective or mirror-image quality to it, if you look closely you’ll see that very few of the opposing and apparently “mirrored” structures are actually identical. The plain background is a nice touch and shows off the rest of the image quite well. The smooth plastic texture in this one is unique. I find it gives the impression that the details have been exposed by chipping the plastic matrix away rather than being carved from it. 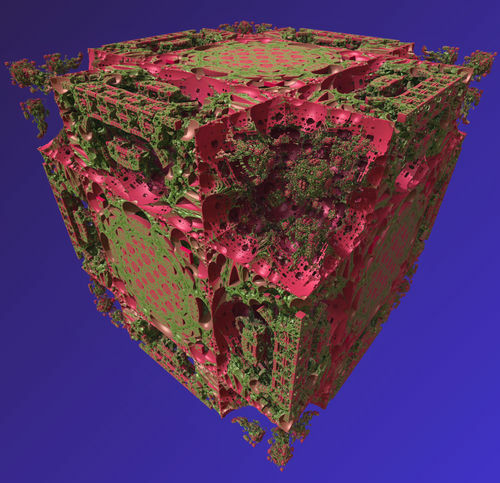 I guess it’s probably a simple image in some ways since it’s just a cube, but as with all these Mandelbox things, there is never anything simple about them. I think the best comparison one can make to an image like this is a fossilized plant. I’ve seen plant fossils in museums and they have the same delicate detail and stone like qualities to them. I take it that “Tglad’s Cube” is a formula made by Tglad. 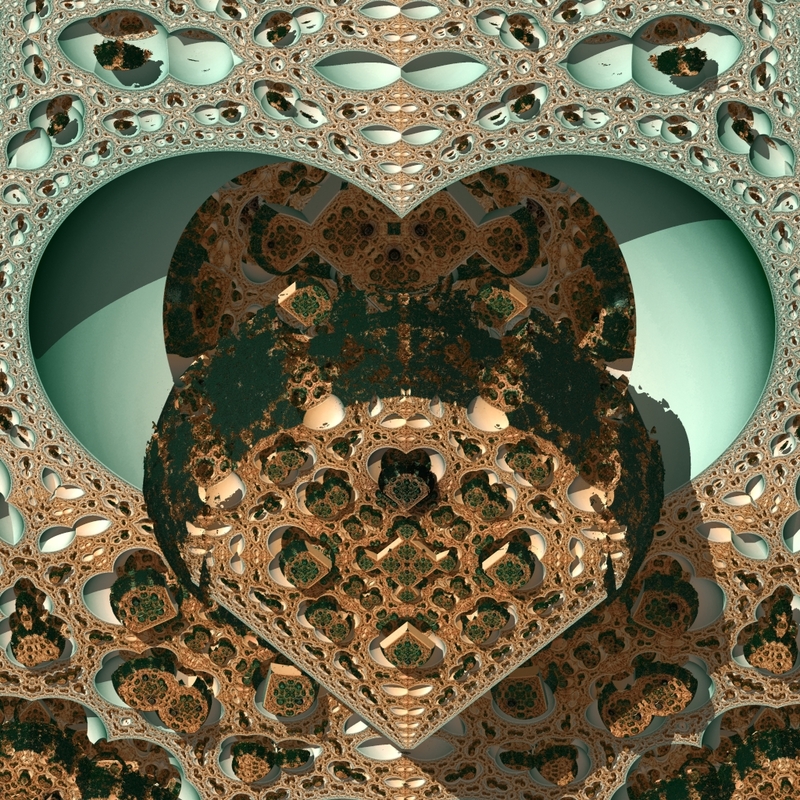 Buddhi, the author of this image, also made the program that created it, Mandelbulber (just for Linux). I tried it out on my ancient computer (P4 2.26 Ghz “single”-core) and it works perfectly although I wasn’t able to make anything approaching the cool stuff these folks I’ve reviewed here have. 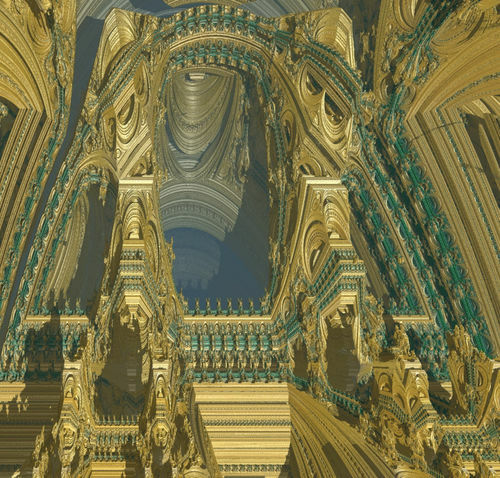 You can see the sort of synergy that been developing over at Fractalforums.com with this 3-D fractal experimentation. You see here? 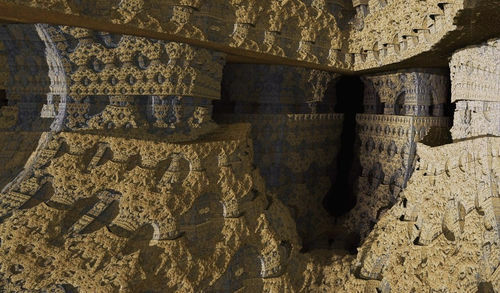 Everything these 3-D fractal programs generate is awesome. 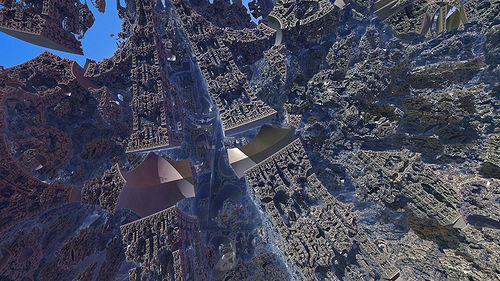 Even this crevice in the side of this larger (I’m guessing) Mandelbox planet is cool to look at. It’s like the whole thing is one gigantic carefully carved piece of art. And I’ll bet every cave and crevice like this one is different in some way or another. Very nice coloring. The texture looks genuinely rock-like and the darker tones gives a nice shadowing and relief to the imagery. Nicely composed too. And the shadowed area to the right of the center suggests there’s more to be explored if we wander in –unless of course something lives in there. So there you have it. For the first time in a long while there’s something I find that’s genuinely new and exciting in the fractal world. I’ve got more to show you, but I thought I’d just focus on the Majestic Panorama genre for now. In the meantime I suggest you check out the Gallery section yourself over at Fractalforums.com. It’s a pretty good collection all on it’s own created by the contributions of the many forum participants that have gathered over there. It’s not the usual sort of fractal gallery and I think you can see from what I’ve reviewed here that it’s got some really great works in it. Just to balance Paul’s comment, it’s true that Ultra Fractal at the moment does not have a publicly available way of exporting 3D meshes or voxel objects for use in other software *but* the number of people wanting to actually do this is minute compared with the number of people wanting to simply create 3D fractal images in a fractal program. I’m on orbit trab ! I’m on orbit trab ! I’m on orbit trab ! For one, That was more a matter of chance. You know! you explore, turn around zoom in and out then: Ah! That’s cool! Have to show it. I must admit that my picture is crappy compared to others’. @ker2x: Thanks for the hires link. It’s really a great image and when I can see even more details it looks even better. @Knighty: You’re too humble. 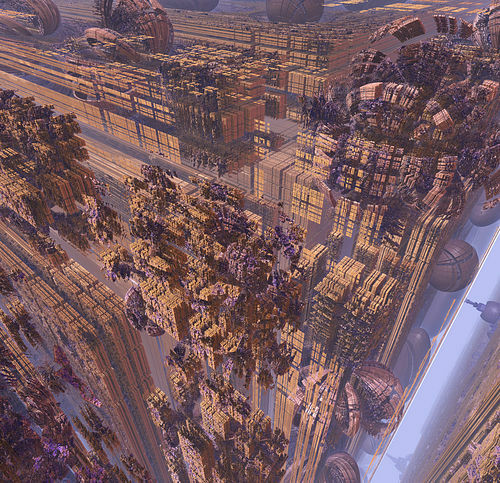 That image features some of the greatest details and designs from the Mandelbox I’ve seen and the picture quality is so good it almost looks ray-traced. I’m glad you both liked the review.